1971's Pearl Showcases Janis Joplin at Her Peak: Chart-Topping Record Includes Hits "Me and Bobby McGee," "Mercedes Benz," and "Get It While You Can." Mastered From the Original Master Tapes: Mobile Fidelity Hybrid SACD is Definitive-Sounding Version of Masterpiece Ranked #125 on Rolling Stone's 500 Greatest Albums of All Time. Joplin Displays Balance of Impeccable Timing, Devastating Vulnerability, and Raw Emotion: Full Tilt Boogie Band, Producer Paul Rothchild Complete Album Steeped in Soul and Loaded With Spirit. Janis Joplin wouldn't be denied on Pearl. The powerhouse vocalist had kicked her addictions, teamed with a stupendous band, and partnered with a producer that knew how to best showcase her voice on record. She came to the sessions with an armload of astonishing songs, and a burst of creative energy that mirrored her rejuvenated emotional state and undeniable spirit. You can hear it on every note of the 1971 record. 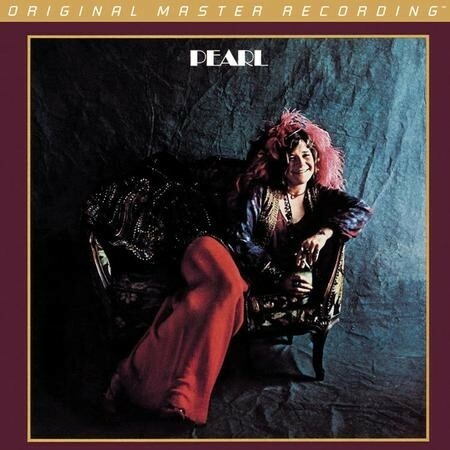 Ranked #135 on Rolling Stone's 500 Greatest Albums of All Time list, Pearl sold more than four million copies and stands as the first female rock superstar's definitive studio work. Mobile Fidelity's hybrid SACD presents the lasting artwork like never before. Mastered from the original master tapes, the iconic audiophile label's SACD takes Joplin and Co.'s stupendous performances to newly transcendent levels. Boasting a fidelity that further magnifies the singer's passion and producer Paul A. Rothchild's clear production, this sterling reissue reveals increased spaciousness, dynamics, and openness. Joplin's husky, strong, and penetrating singing has never sounded so vibrant or made deeper connections. Warm, organic, and free of any artificial ceilings, this version lets you step into Sunset Sound Recorders with the performers, such is the degree of realism and authenticity. Indeed, few, if any words, describe Joplin better than "authentic," and her spirit comes to life on this disc in positively transcendent fashion. Like its headliner, this SACD leaves it all on the floor.